Old Pacific Electric Railway cars await their conversion into scrap metal at a junkyard on Terminal Island in 1956. The collapse of the railway system that once crisscrossed Southern California was due to a number of factors, including the rise of the automobile. 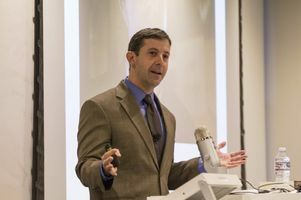 The history and future of rail transit in Los Angeles were the focus of a recent lecture at the UCLA Luskin School of Public Affairs by professor Ethan Elkind, director of the Climate Change and Business Program, with a joint appointment at UCLA and UC Berkeley schools of Law. He is the author of “Railtown: The Fight for the Los Angeles Metro Rail and the Future of the City” (University of California Press, 2014). A Pacific Electric Railway Red Car is southbound on San Pedro Street in downtown Los Angeles on its way to Santa Ana in the 1940s. 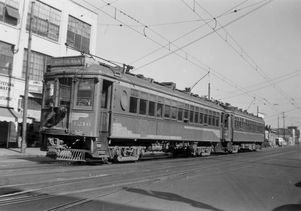 Prior to the rise of the automobile, Los Angeles developed a complex system of electric streetcars, which became the primary mode of public transportation for the region. 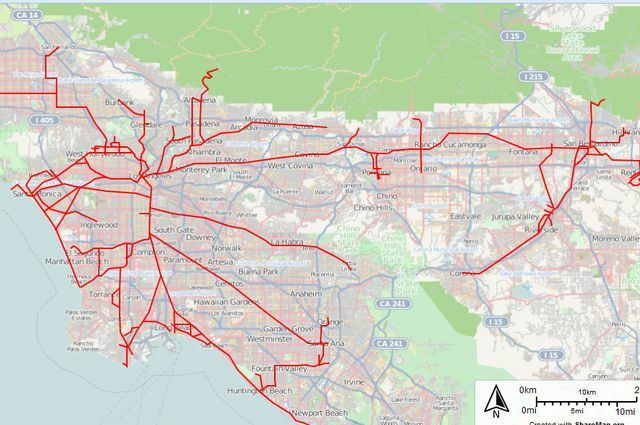 Elkind displayed a map of the old Pacific Electric Railway system and its vast number of routes crisscrossing Southern California — a far cry from the relatively modest number of rail lines in Los Angeles today. The last streetcar ride took place in 1961 — its demise was attributed in part to a shift toward policies that favored automobile drivers by widening streets and developing more parking. Additionally, the street cars faced their own decline in popularity, plagued by poor maintenance, scheduling issues, operator strikes and other issues. L.A.’s explosive population growth, however, bred traffic congestion, Elkind said, which led one public figure to make public transportation a top issue. “In 1973, City Councilman Tom Bradley ran for mayor of Los Angeles, and, for the first time, made transit a priority,” Elkind said. Bradley made an “overly ambitious” campaign promise: to break ground on a new rail line within 18 months of his inauguration. In reality, it took nearly 20 years for that promise to be fulfilled. In the 1970s, rail development became an attractive proposition for municipalities because the federal government granted 80 percent of the funds needed to construct a new rail line, contingent on a 20 percent match by local governments. Ultimately, several tax-raising measures passed by county voters paved the way for the first crop of new rail lines in Los Angeles, beginning with a downtown-to-Long Beach route that opened as the Metro Blue Line in 1990. 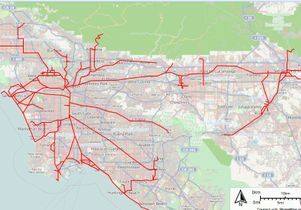 Today, 105 miles of railway track reach different corners of Los Angeles County and draw more than 360,000 riders daily. More tracks are on the way thanks to the 2016 passage of Proposition M, which raised sales taxes to pay for new rail projects, including an extension of the Purple Line subway to Westwood and a Green Line connector to LAX. However, some obstacles remain for transit in Los Angeles. There is an ongoing struggle to make projects more cost-effective and efficient while also keeping pace with continuing population growth for the region. Zev Yaroslavsky, former Los Angeles County supervisor and director of the Los Angeles Initiative at UCLA Luskin, introduced Elkind — noting that he rail expert had spoken earlier in the day to Yaroslavsky’s undergraduate capstone seminar about the history of transportation in Los Angeles. “There are a lot of exciting dynamics that are going on in Los Angeles and Southern California in public transportation that are changing the face of the region,” Yaroslavsky said. The event drew a big crowd that included UCLA students, as well as community members. First-year public policy graduate student Estefania Zavala attended the lecture because of her interest in transportation policy. 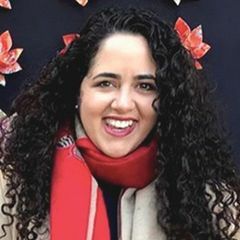 “It was really interesting to hear about how equity plays a role in the system and what introducing a new Metro station in a really impoverished neighborhood does to gentrifying that neighborhood,” she said. Transit issues are also personal to her. “It was a little bit frustrating just to hear about how inefficiently the system has been laid out,” Zavala said, noting that, as a commuter from Azusa, she wishes that better transit options existed to get her to Westwood. The public policy department at the UCLA Luskin School of Public Affairs co-sponsored the event, along with the history department and the Lewis Center for Regional Policy Studies. This story is posted on the UCLA Luskin School of Public Affairs website. 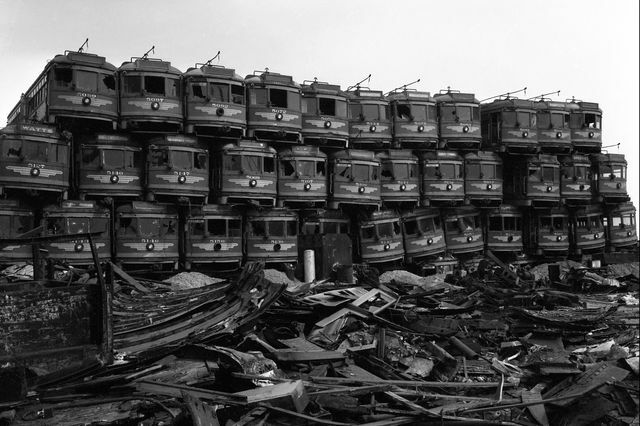 Old Pacific Electric Railway cars await their conversion into scrap metal at a junkyard on Terminal Island in 1956. Ethan Elkind is director of the Climate Change and Business Program, with a joint appointment at UCLA and UC Berkeley.